Up for some no-strings-attached fun? Up for some flirty action tonight? Then UpForIt.com is exactly what you have been looking for. This is a dating site which cuts to the chase. Check out the options within the massive 1.8 million membership and meet up for some hot fun straight away. There is even a “Meet Me Today” calendar to help organize your hot dates, while “flirtcast” helps you get in touch with multiple users at once. There is a real emphasis on direct, instant contact at UpForIt.com and so there is an extensive range of options when it comes to communicating with other users. In addition to the standard formats of private mail, instant chat and “winks,” you can also try out a video or voice chat. Meanwhile, “flirtcast” enables you to send a cheeky message to multiple users, maximizing your chances of a reply. You can also get to know exactly what a potential match has to offer by viewing personal user videos. Meanwhile, the numerous active chat rooms provide another chance to interact with other members. The user profiles are more interactive than you will find at many dating sites – You can rate profiles and photos, which in turn boosts their visibility in search results. Once you have made a few contacts, use the “Meet Me Today” tool and organize your meetings and dates. Getting started on the UpForIt dating site is extremely easy. You will initially be asked for some very basic information, such as gender, date of birth, zip code plus an e-mail address and password. You will then be sent a verification e-mail to ensure that you are a legitimate user. Simply click on the link and you will enter the site, where you will be prompted for a brief status and a short description of what you are looking for using drop-down boxes. You are then free to browse and explore. You should have no security concerns using UpForIt. For a start, the e-mail verification system is a great tool to guard against scammers. There is also a useful list of safety tips, which is well worth reviewing. Most importantly perhaps, if you are bothered by an overly-enthusiastic member, then you are able to block and report the user. As any UpForIt review will tell you, women have full access to the site for free. That’s right, if you are female you need not pay anything. However, men will need to choose between free and paid membership. Free members can browse the site and create a profile, but are unable to view full profiles, including many of the photos, especially the more personal images. In addition, they have very limited ability to communicate and so if you really want to have some adult fun, you will need to become a member. There is a 3-day trial for just $1.06 per day. A 1-month package costs $24.49, while a 3-month deal is $13.99 monthly and a 6-month membership comes at a cost of just $11.19 per month. Finding like-minded singles could not be easier. Every time you log-in to UpForIt.com, you will be presented with a whole selection of potential matches on your personal dashboard, determined by the information you have submitted. You will see a snapshot of their profile and can decide there and then to chat, wink or add them as a friend. Meanwhile, the tool bar at the top of the page gives you the opportunity to conduct a quick search and if you want to put yourself out there, a convenient box in the top left of the screen allows you to send a “flirtcast” far and wide. Also, profiles are well presented and let you assess the possibilities with ease. And of course, there is a very effective mobile app available too, enabling you to always stay in touch with the action. Searching is as simple as logging in at UpForIt. You will automatically be presented with around a dozen match options based on their suitability according to the personal information submitted. However, if you want to take a more proactive approach to your quest for flirty action, you can conduct a manual search. The quick search allows you to look using general criteria such as age, gender, location, photos and videos. 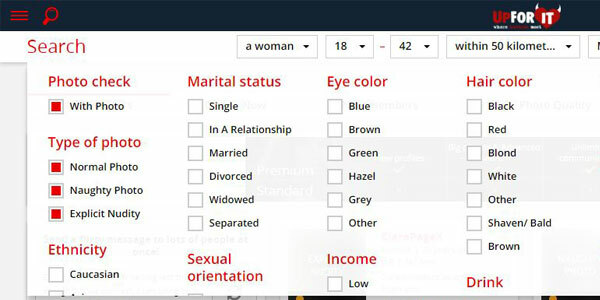 The advanced search lets you expand the search fields to a large range of options, including lifestyle choices and of course gender preferences. It is also worth noting that you can search via who is online now, who was recently online or you can conduct a useful “reverse search” which shows who is looking for someone like you. This is not just a site for cheeky, playful dating, but one of the very best sites to meet up with like-minded singles looking for a good time. If you want to find the love of your life, read up on our review of Zoosk.com. But if you want tomeet up for some flirty fun, then UpForIt is the place to be. The whole site is geared towards instant contact and action, with plenty of chat rooms, naughty photos and live cams to keep you busy. Well-constructed and eye-catching, this is an outstanding option for no-strings-attached online action.